Nissan were first to invent the crossover and their latest creation is the stunning Juke. A very comfortable and easy car to drive aimed at people who want to stand out. Comes with lots of optional extras to help you personalise your car despite the generous standard equipment. Visia offer comes with Alloy Wheels, AC, ABS, Electric Windows, IsoFix, Immobiliser, Stability control and six airbags. Acenta also includes Climate Control, Bluetooth, iPod socket and Nissan’s Dynamic Control System. The Acenta Premium & N-Tec includes SatNav & Reversing Camera. Tekna also includes Leather Trim, SatNav and Reversing Camera, average 58.9 / 70 mpg. Available in manual or automatic transmission, petrol and diesel engines. Which Nissan Juke are you going to lease today? We offer top quality Nissan Juke from brand new, nearly new, slightly used or ex demo, whether you have good or poor credit rating, pay a low or no deposit. These Nissan Juke can be leased or financed and come with a warranty, HPI checked and when contract hire leasing, include UK nationwide delivery and AA or RAC Roadside Assistance cover for peace of mind. 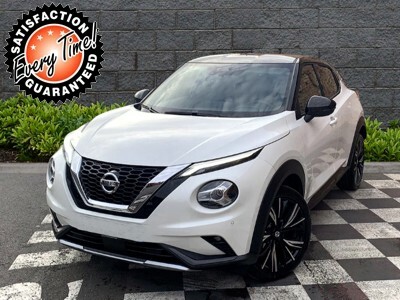 Time4Leasing can offer you the latest Nissan Juke lease deals at lower prices because these vehicles are exclusive and offered at lower rates to customers that have good, poor or even bad credit history score ratings. The Nissan Juke is aimed at people who want to stand out, so there are lots of optional extras to help you personalise your car despite the generous standard equipment. If you are worried about having to use a bit of muscle power to operate the clutch on the diesel versions, either go for the petrol or the automatic models. Entry-level Visia cars come with alloy wheels, air-conditioning, electric windows, stability control and six airbags. Meanwhile Acenta spec adds climate control, Bluetooth connectivity, an iPod socket and Nissan’s Dynamic Control System. A Tekna model with leather trim, satellite-navigation, a reversing camera and a keyless system completes the line-up, but we’d avoid this because it makes the Nissan Juke a bit pricey if you are buying one from brand new. However, if you are going to lease a Nissan Juke you might like to lease a used or nearly new one that will save you a significant amount of money. Three engines are available – 115bhp 1.6 and a 1.6 turbo petrol with either 188bhp or 197bhp, plus a 109bhp 1.5 diesel. Both turbo petrol engines are properly quick, and while the more mainstream engines aren’t, they’re powerful enough. We reckon the diesel is best thanks to its blend of performance and economy. Some people ask for a Nissan Duke and we do assume they mean a Nissan Juke. In any case we do have Nissan Jukes regardless if you call them Dukes or Jukes. The Tekna nearly new offer includes Diesel Engine, Sat Nav, Full Leather Seats, Heated Seats, Bluetooth, Reverse Parking Camera, Cruise Control, Climate Control, Alloy Wheels, Electric Folding Mirrors, Power Steering, Electric Windows, Keyless Start, keyless Entry, Aux, USB, Automatic Lights, Rear Privacy Glass, One Owner, Remote Central Locking, CD Player, ABS, Immobiliser, Traction Control, Onboard Computer and Isofix. There are 93 Nissan Juke Lease Deals on Offer.